By Lino Lista from Italy and Chuck White from Guam. 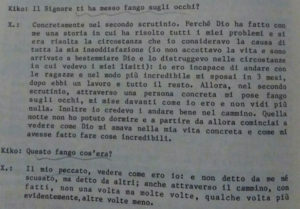 A treasure trove of Kiko’s secret catechisms has recently been found in Italy. This is quite a blessing because these secret documents give us more proof of the twisted interpretations of Scripture that form the foundation of the Neocatechumenal Way. Here is an important example. The “discovery” in Italy of old copies of the Catechism of Kiko following the Second Scrutiny, up to the stage of Election, confirms this belief. That is, in the stage of the Traditio in the catechumenate of Kiko, this catechesis “of the mud” is revived and expanded in an intolerable way. 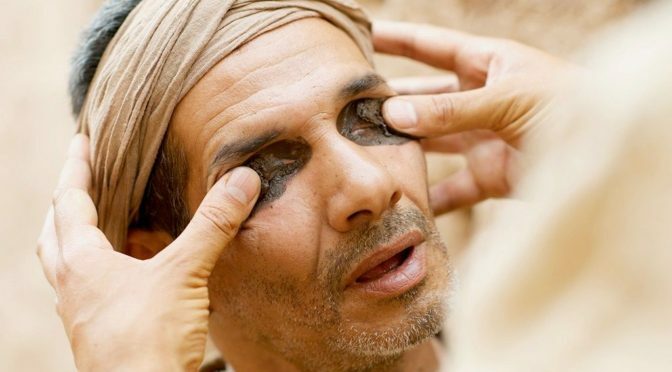 The foundation of the Traditio stage is precisely the catechesis of the man born blind, which is given on the first night after the Light Ceremony in the Convivence that “opens this time.” The story of the man born blind will be the basis of individual scrutiny of the Neocatechumenal Way, a scrutiny that is used to assess whether members are fit to go and evangelize in the houses, two by two. The following passages were taken from an early version of Kiko’s catechism, which is almost a Q source of the “Gospel according to Kiko”. 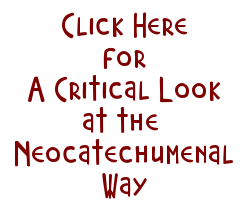 From it, one can draw the author’s original thought before any editorial interventions and corrections were made to the catechetical directory of the Neocatechumenal Way (NCW). In a movement like the NCW, where the oral tradition of the old catechists has been handed down from master to disciple, you can rest assured that the original thinking of the founders permeates the practice of the Way, as it does in the liturgy of the Way. 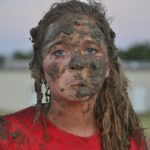 Kiko: The Lord put mud on your eyes? Kiko: What was this mud? What should we say? This is not simply a broken exegesis, but rather it is a misappropriation, with unprecedented deception, of one of the most tender, lovable and charming miracles of the Gospel in order to promote the Way and its Gnostic doctrine of sin. The statement “but how cruel is this Jesus Christ” is certainly a Freudian slip, an unconscious revelation of the nature of the sludge/mud in the Neocatechumenal Scrutinies, when the muddy “enlightened” besmirch the neophytes one at a time, having been all trained to lay bare their own consciences. And they consider this to be a “charism”, an “anointing”, and a “grace”!